In the wake of the worst mass shooting the United States has ever experienced, it is useful to consider the dynamics of terrorism. What is it? When is terror not terrorism? Definitions of terrorism are many and varied, and agreement on them is rare. To cut it down to bare bones, terrorism is the use or threat of violence to create fear in a population in order to achieve a political goal. Terrorism’s fundamental component is as an assertion of political influence through violence – usually from individuals or groups too unpopular, or completely disenfranchised, to express themselves any other way. Most commonly, terrorists are non-state actors, and nation states relegate them to something akin to medieval outlaws. Civil rights, which apply to most ‘normal’ criminal suspects, are often suspended for terrorist suspects and increasingly states are tolerating the shooting dead of terrorists on the grounds of national security. This is due to a particular threat they are perceived to present – and the terrible aftermath that results if terrorist plots are not disrupted. Nation states can be terrorists too. The most glaring recent example is in Myanmar where state force has been used against Rohingya civilians to completely alter the demography of a region of that country. The civilians targeted offer no threat to the state of Myanmar, and the military agents of the state are deliberately killing and injuring people, and destroying their property with impunity. There appears to be no judicial oversight to these actions, a critical aspect of the legitimacy of a state’s use of force. Terrorism is seldom clear cut, and is often refracted through a lens of varying perspectives. If the Rohingya people were to try to defend themselves, to resist the forces of the state or chance an attempt to fight back, they would almost certainly be regarded as terrorists by the state. They would be seen as terrorists by the terrorists themselves, rendering the term terrorist a problematic label - subjective, pejorative and imprecise. 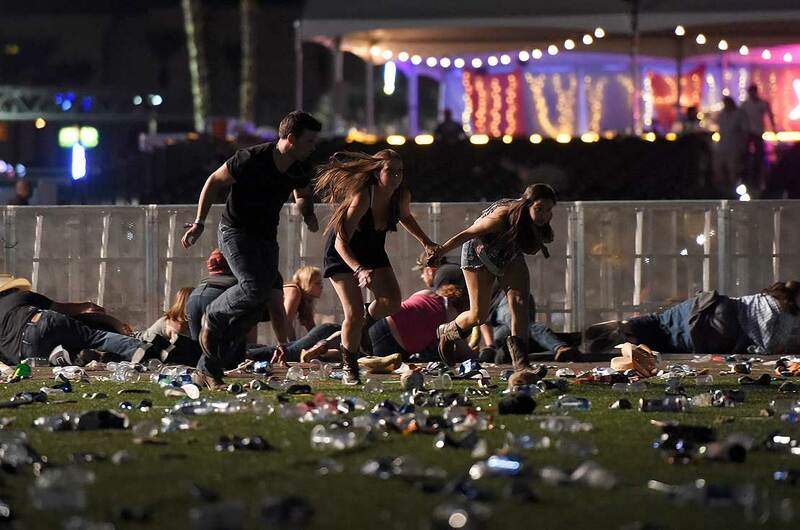 Fifty-nine people shot dead, and in excess of 500 people injured with a death toll likely to rise in Las Vegas is an almost incomprehensible and senseless tragedy. This is terror but not terrorism – it is deliberate aggravated violence against people posing no threat to the perpetrator Stephen Paddock, and for reasons that will possibly never fully be known. Paddock could not face the enormity of what he had done and killed himself. Had he lived, any reasons he gave would have made little sense. The Las Vegas shooting underlines the reluctance of Americans to give up their civil right to buy as many guns as they want, to carry them wherever they want, and suffer the awful consequences of such a useless right. Paddock has inflicted more harm on the US than any single lone-actor terrorist. He hardly had to conceal anything to do it - he brought his weapons and cameras over the counter, he set up in a busy hotel and he was unreachable for a short but deadly period of time. For all the blood he spilled, he caused a fraction of the harm Americans have caused themselves. A total of 6,739 Americans were killed by the accidental discharge of firearms between 2001 and 2010. Between 2001 and 2013 over 150,000 homicides occurred in the US by perpetrators using firearms. Americans seem to be terrorising themselves, and yet remain remarkably resistant to changing anything domestically to prevent these tragedies. They are curiously ready to declare a war on terrorists in other lands, even though actual terrorists have caused only a fraction of the mass casualty events in the US. In a bizarre twist, ISIS claimed responsibility for Paddock’s actions. Their assertion is in line with their recent opportunistic attempts to claim bombings and other mass killings. This is a desperate attempt to grab the horrific afterglow of tragedies they probably had little inkling were going to occur. It presents these events retrospectively as all part of a grand plan, imposing order over chaos and adding terrorism after the fact, to the purposeless terror of these actions. Who knows if lone actors like Omar Mateen in Orlando, or Salman Abedi in Manchester would ever have done what they did without the media and online Jihadist milieu to incite them. Paddock’s actions suggests perhaps they might have. ISIS propaganda claims these events as their own making, and perhaps we too readily accept this. The mass killings of 2017 in many cases seem like the actions of deranged people, in contrast with the terrorists of the 20th century who were, for the most part, remarkably sane. Meanwhile, US government anti-terrorist rhetoric must rankle in the wake of the latest tragedy, when leaders fail to address gun control laws that enable their own citizens to inflict sheer terror on each other. Terrorism expert Dr John Battersby is a Teaching Fellow in the Centre of Defence and Security Studies, Massey University, specialising in police, intelligence and terrorism research.